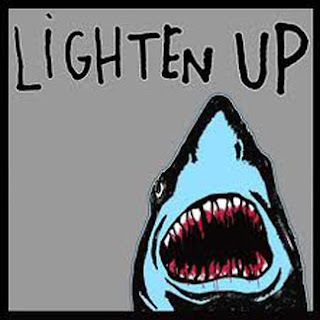 Salvation And Survival: Lighten Up! My husband, Peace-Loving Warrior, says that I've gotten so serious in my posts. That I and my readers need an occasional break from my heavy dissertations.... perhaps more blogging on recommended products and books; at least a more positive subject matter from time to time. I agree with him. I search for those heart-warming stories and motivating testimonies that will encourage all of us, and rally our lagging spirits. Heaven knows we need them! And I promise to broaden my quest. In fact, you'll see some departures from weightier news items in the upcoming days. The truth of the matter is that I WANT to lighten up .... I really do! Nothing would give me more pleasure than to see a brighter future for this nation and to be able to write about increased prosperity, greater security and privacy, and the restored protection of our rights and liberties. Here's the problem: I can't find evidence of any of that! And believe me, I so want to see it! Everywhere I turn; every media outlet, news website, or social commentary source has nothing of the like to report. Do you think I like reading all the negative headlines? And lately it seems that day-by-day, each succeeding headline gets worse than the one before. Politically, we have the Immigration debacle, government scandals that appear to be immune to legal prosecution, and a broken system of representation in the nation's capital. On the world stage, there is the looming threat of yet another war that seems destined to involve our war-weary troops; while our sovereign power is subjugated in favor of "the greater good of all nations". And from the social perspective .... don't even get me started! A man, whose house is vandalized by some rotten kids, catches them in the act and locks them in a room until the police arrive --- and he's the one that goes to jail! Then there is the 8th-grader that is facing his own year in jail for wearing an NRA T-shirt. And let's not forget the Pagan Academy in New York that is teaching adults to become witches, or the "Godless" Church being promoted by atheists, where “a godless congregation will meet on the first Sunday of every month to hear great talks, sing songs and generally celebrate the wonder of life.” A church that doesn't include God?!? The world has turned upside down! I sometimes feel as though I am living in an alternate universe. Yes, I would love to change the mood of my writing. And I am indeed becoming tired of finding so little to praise. But as I say in my bio, I will speak boldly and plainly about what I see happening in the world .... unfortunately, what is happening doesn't fall into the category of "sunshine and lollipops." From the moment I received the vision for this blog, I have tried to "listen" to what I am supposed to say to all of you. I don't think I am wrong in discerning that we are on the precipice of some great metamorphosis; we are in the process of changing from one condition of human existence to another. All my spider senses tell me that it's in stark contrast to God's desire for mankind, and His specific will for me. So what is my responsibility as a chronicler of our times? I can't help but be honest about where my head and my heart are. I will always be on the lookout for those stories that refresh our hope. They're out there and they're what keeps me going, so I know you need them, too. But I will also continue to give you a sincere and frank account of the issues and events that concern me and that I feel need our scrutiny. You will not always agree with my opinion, or the subject matter, but that's OK. We just need to agree on the importance of knowing what we're facing. John 16:13 "When the Spirit of truth comes, he will guide you into all the truth, for he will not speak on his own authority, but whatever he hears he will speak, and he will declare to you the things that are to come." I don't think you are being melodramatic at all. you are making others, myself included, more aware of what's going on in the world. and doing it all biblically. right on! is it nice to have a "lighter" message once in a while? you bet. go where your heart, and where our God, leads you :-). THANK YOU! I have to keep reminding myself that, ultimately, my purpose in writing is 1) to please God, 2) to talk about issues that I feel we need to be aware of and that God wants us to focus on, and 3) to do it all with a "bigger picture in mind" ... how it all points to God's plan for us. As a Christian, that's how I try to live my life and I love connecting with others who are following the same path. You have inspired me to keep putting one foot in front of the other. I came across E.W. Jackson today, who is running for the Lt. Governor of Virginia. He gave a speech that was so uplifting and inspiring I wanted to share it with you and your readers. I don't know how to send you the link directly but if you go to www.jacksonforig.com and open "The Speech That Rocked" I think you might enjoy it. I hope this man is the real thing, because we need men like him. This man expresses all my thoughts and desires for this country. May God bless him! First, as I've said before, I'm very thankful for all of your insightfulness and your passion and committment to the Lord and what He wants for us and wants for us to see in these difficult times and I believe He uses you to share that with us. Yes, the posts are heavy, but it's what is happening and what people need to know about if they're willing to listen. It's the listening part that is difficult to get others to do. The bottom line, for me it's frustrating when I see others acting like nothing is any different than it was five years ago and they just continue to bury themselves in more disbelief! You share with others information and research that you won't find in many other sites. We need to keep our eyes on some personal time and happiness too so we don't fall into a slump, because it can easily happen and we need our focus to be strong where it is needed. I feel very burdened at times having the knowledge and not getting anyone to listen or understand and sometimes I just need to take a "vacation" for a day or two so I can re-focus on things that I need to pay attention to personally, but towards that end goal of providing spiritually and physically for what's coming down the road quickly. It's maddening at times, but I realize, though I don't like it, everyone is to answer for themselves for what they did and didn't do and all we can do is try to step in and help them see. If they're blind to this as much as we try and try again, if they won't, it isn't going to happen, period. We can't take all the stuff with us that we prepare for, though I would counsel everyone to do what they can with what they have on that preparedness side, but we can all spiritually take the road that will take us to the narrow gate and pray that we'll be ready to enter as He has so wisely guided us. I truly believe that we need to stay close to those who will walk with us on this path and know who our true friends, brothers and sisters are in Christ so we can strengthen one another. These are definitely trying times and in my heart and spirit, I feel that this is just some of what is to come and I feel that we need to strengthen our spirit to endure those times. Thank you Belle for who you are and what you do for the Lord. Lisa, we are all standing where God has placed us, and I know you are doing your part; doing what He made you to do. And it's when we get discouraged that He sends an encouraging word or two through others that are fighting for Him. Thank you for always being there and having a wise word to re-focus me. I know there are others out there like you that have the same feelings and struggles that I do. I want to assure you that He is walking with us! We must never give in to the doubts or the fears. A victory is close at hand!